Response: Indeed, He has risen from the grave! These are the opening words spoken by a Deacon in the Eastern celebration of Easter, often called the Feast of Feasts, being the most important day on the Church Calendar. For this occasion I have published a 13-minute Podcast homily on the AIC Web Site, in which I elaborate on the history of the Eastern celebration of Easter at Antioch, the meaning of Ranson and Propitiation, and, in modern life, the choice facing all Christians of being either Esau or Jacob. Listen to the Podcast Homily. 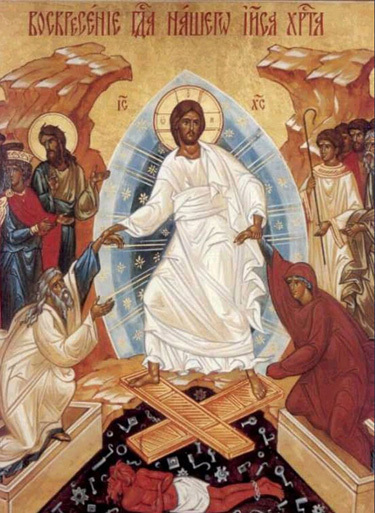 The Harrowing of Hades, the Resurrection Day icon of Jesus Christ in the Russian Orthodox tradition. In the Homily I refer to one of the most remarkable icons of the Eastern Church tradition, The Harrowing of Hades. In this single icon are many theological messages of great importance to an understanding of traditional Christian teaching. Since the Homily is sound-only, I have included for this Blog. Jesus stands, surrounded by the blue aura, signifying the Glory of the Lord, with the golden disk behind His head in the traditional Eastern Church manner including the Greek equivalent letters for I AM (Exodus 3:14, 15). He stands upon the coffin lids symbolic of the gates of Hades, which by His Resurrection He has broken open. With His right hand (left side of the icon) He lifts Adam, dressed in white, from Sheol (the Pit). With His left hand (right side of the icon), He lifts Eve, dressed in Red. In the Pit beneath the destroyed gates of Hades are the keys which are referred to in Revelation: I hold the keys to Hades and Death. Also in the Pit is a bound figure who is not raised from the dead, symbolic of those unrighteous who will not enjoy everlasting life in the Kingdom of the Father. The figure at the left background (to the right of Jesus Christ) is John the Baptist, called the Last Prophet of the Old Testament, symbolizing the transition from the Old Testament to the New. At my former parish of St. John Chrysostom, I always hung this icon on the front of the pulpit throughout Easter season, where the people could easily see it. The same icon was held aloft in the Eastern Morning processional around the outside of St. Joseph’s Villa Chapel, Richmond, VA. The full text of the Easter Morning service, based on a Syrian Orthodox Church model, is available in paperback and Kindle versions in the AIC Bookstore publication. Occasional Services for Anglican Worship at my author page at Amazon.com. (www.Amazon.com/author/ronald-e-shibley).